• To give students a comprehensive foundational understanding of the types of labyrinths, their use, students to design a 7 path labyrinth and construct one onsite. • Understand the nature of labyrinth construction, including their history, geometry and uses. • To understand how to use and communicate with a labyrinth, appreciate and apply dowsing to the energies within the site. • Definition and description of labyrinths, types of labyrinths built, draw a scaled plan and apply it into a practical situation. • Students to design a labyrinth using classroom tools, on‐site circle construction using tape and flags. 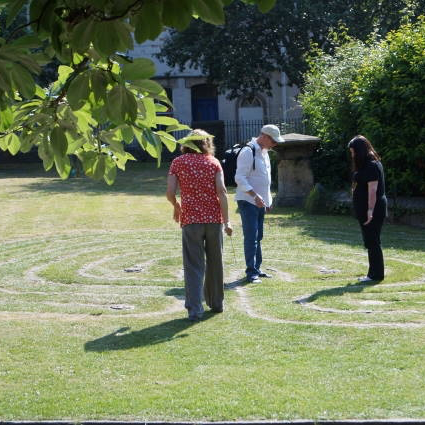 • Ethical consideration when dowsing within the labyrinth, including respecting and removing personal and community boundaries and areas of privacy and confidentiality. • Information about the BSD, training programme, special interest and local groups.